ENG: These photos were taken at morning, we had super warm and sunny day, but closer to nightfall all streets were cowered with show. Can you imagine? Definitely city of contrasts, no more no less. Sharing with you this spring outfit and send a lots of kisses. Thanks for stopping by! RU: Знаете, есть такие снимки под красочным заголовком «За мгновение до…»: сначала автор позирует на фоне обрыва/за рулем, а потом, сами знаете что бывает) В моем случае все было гораздо спокойней: попрыгав на солнышке в весеннем наряде, через полдня пришлось в срочном порядке искать шапку и варежки: у нас выпал снег. Город контрастов как он есть…Шлю вам поцелуи и апрельское настроение! Спасибо, что заглянули! This outfit is very feminine and lady like! I really like your skirt...and your heels are so cute. You cordinated colours perfectly!!! Thank you very much, Ivana! yes your costume is so cute. I think you are taking huge risk to take this photo's really nice. Keep it up. Please do visit my fashion blog which has insights & reviews on celebrity styles, designer shoes & bags. Would be lovely to chat about fashion with you and become friends too. 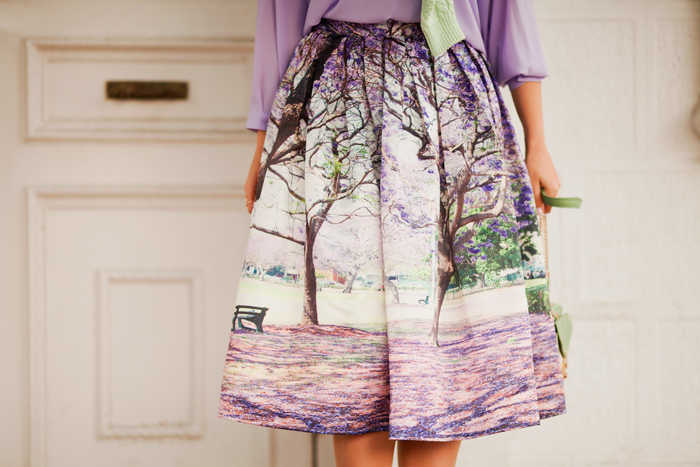 I want that midi skirt, right now!! You look so chic and edgy in it and it totally matches the top as if you bought them together!! The bag and shoes are a stunner too! Очаровательная девушка в воздушном сиренево-зеленом наряде! Все очень красиво подобрано! Юбка стильная! Удачного дня! Целую! I love the pastels in this outfit!! Beautiful and vintage like combo! I really love how you bring in the spring. Now this is making me wish I could wear my sundresses now. But patience is the key. Really beautiful skirt and color combination. Super love. You look very dainty and blooming like the flowers in spring. Yeap, patience is the key, spring is coming soon! OMG! It's very beautiful this skirt! I'm in love with this look! Perfection ! Снег?? Какой же прекрасный у вас город! И ты красотка, как всегда! What a beautiful und feminine Look, dear Viktoryia! Love especially your cute skirt! You look adorable!!! Hi V - the color palette here is SO AMAZING - very spring fresh. What amazing colors, love it! Fabulous outfits, the girl in this outfits looks more glamorous. Overall perfect combination. Really looking very pretty.. Thanks for sharing with us. IskiUski is an online jewellery store that houses high quality jewellery and accessories or earrings women. home vastu tips entrance advises that any property with entrance facing towards the south western direction must be completely avoided as this is the direction of devil energy, which brings misfortune.